3:00 pm You’ve done some walking, now its time for a little break. Off to Leopold’s Ice Cream shop for a dip (or two) or their homemade ice cream! Yum, that’s a great reward for all that walking. 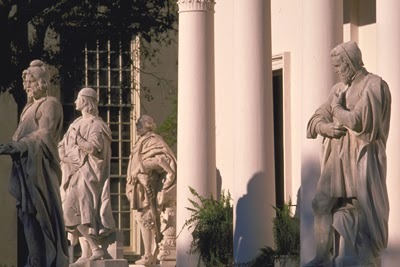 4:00 pm Let’s head back to the inn but on the way, let’s stop by the Cathedral of St. John the Baptist on Lafayette Square for a look around. 5:00 pm Back at the inn. Let’s grab a complimentary cold or hot beverage and chill out on the side porch. Maybe bring a book and relax for a while. 9:00 pm After dinner drinks at Jazz’d Tapa Bar for some music and a little dancing. 10:00 pm If you want a little late night sweet take a stroll over to Lulu’s Chocolate Bar. If you’re up for more dancing and libations a trip to Factor’s Walk and a visit to Savannah’s very own speak easy Mata Hari. "As one walks from square to square, passing each building, discovering a different nuance of detailing, from the eaves to the railings and stairs, the visual-architectural experience can be as overwhelming to the eye as a symphony is to the ear." --Eric Meyerhoff, Savannah architect. Note: The Savannah architectural firm of Robert Gunn and Eric Meyerhoff designed the now-famous Savannah riverfront walk known as Rousakis Plaza. It runs along the Savannah River harbor. "We always tell our guests to walk over to the Forsyth Farmers Market in Forsyth Park on Saturday mornings - starting @ 9:00 a.m. 'til 1:00 p.m. Then to take in Forsyth Park, such a beauty in itself. 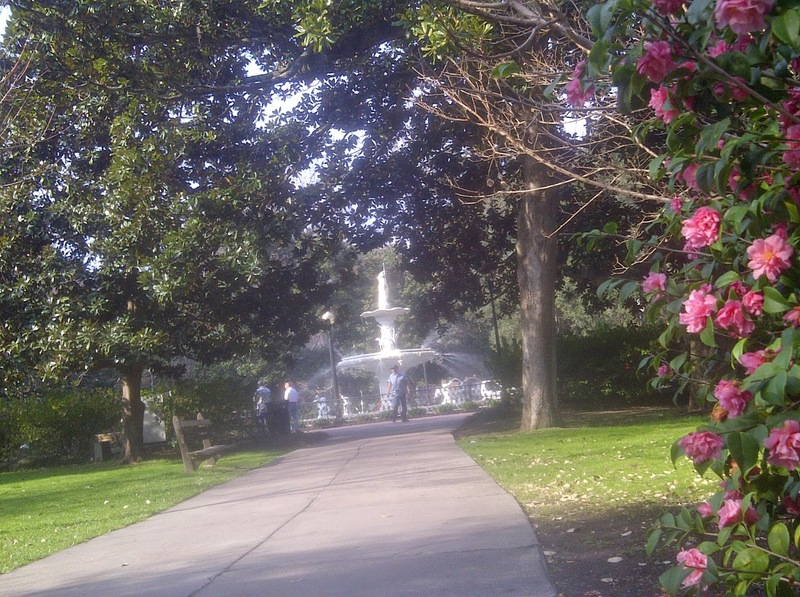 Early morning guests can go for a run at Forsyth Park -- 1 mile around. Then go down Bull Street to the Design District that takes in Whitaker Street (near Jones Street) for morning strolling and shopping. If it's Monday through Friday, stop into Mrs. Wilkes for a true southern lunch. Or, keep on going to Broughton Street for more local shopping -- the vinegar store [Low Country Gourmet], Savannah Bee [honey] store, The Salt Table, and then onto Savannah City Market." “I love the little spots, so I’m eager to find the great little places to shop, explore, and eat in Savannah. Like other historic B&B owners in Romantic Inns of Savannah, my experience helps guests to bypass the iffy-ness, while still finding unique things to do, purchases, and deals,” the Savannah B&B owner Diane Crews adds. The innkeeper’s fresh Savannah ideas point to the little local spots where beauty and fun are sure to be found. “My recommendations are not intended as a checklist,” Diane assures, “but rather pointing out the consistent places that I enjoy and my guests repeatedly praise. Green Palm Inn’s recommendations are adjusted to compliment each guest’s interests.” Located near the waterfront, below Diane shares her ideas for ARRIVAL DAY -- an easy orientation to downtown Savannah's friendly and welcoming day in the historic district any time of year. Leopold’s Ice Cream Shop (212 E Broughton St., 912/234-4442). Papillote French Cuisine to Go (218 West Broughton St., 912/232-1881). The Paris Market & Brocante (36 West Broughton St., 912/232-1500). Red Clover (53 Montgomery St., 912/236-4053). Guests love this value-packed boutique. Ellis Square, Savannah’s newly restored square. Johnny Mercer’s life-size statue, entertainment, and comfort-break facilities are here. Jen’s & Friends Martini Bar (7 E. Congress St. 238-5367).